Since the 7th century the Tuareg people of North Africa have roamed the vast regions of the Sahara desert as outcasts after their land was invaded by eastern armies forcing them into migration. 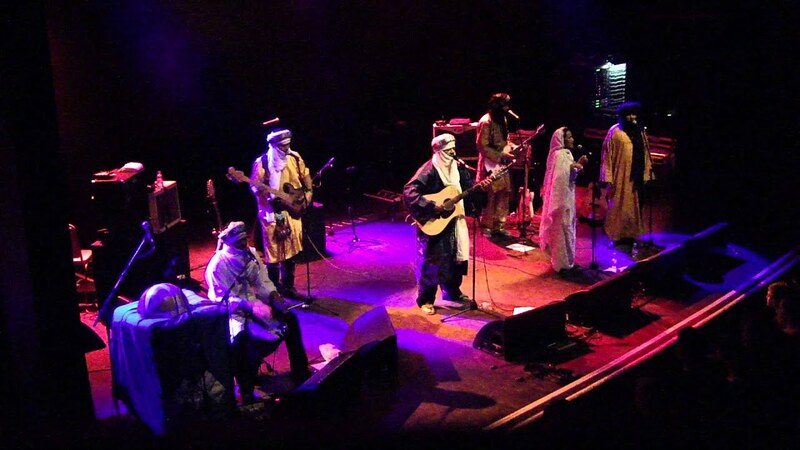 Toumast - Guitars and Kalashnikovs, a popular movie of our catalogue, portrays the struggle of the Tuareg people through the music of Moussa Ag Keyna and Aminatou Goumar who together formed the music group ‘Toumast’ (meaning ‘identity’) in Niger. In one of the opening scenes of this insightful documentary, Moussa explains to a live audience how the Tuaregs didn’t used to play the electric guitar, for 20 years now they’ve had to play guitar and make war due to repression by the state dictatorship. “It’s a pity that people no longer want the nomads to go free...The only thing we want is to live like our ancestors, to move as we want across the whole desert” he says. Viewed by governments as bandits and outsiders, in recent history the Tuaregs have been victims of massacre and imprisonment. Indigenous to the land, their cause has gained further attention from the western world through the spirited and energetic music of it’s people, most notably since the fusion of the cultures sound with modern genres labelled ‘Desert Blues’ & ‘Tuareg Rock’. Their music speaks about the nomadic way of life and the hardships they have faced in their long and ongoing search for peace. In Toumast filmmaker Dominique Margot captures an intimate portrait of the vast Saharan desert region where many people live in extreme poverty, whilst still evoking a sense of awe and wonder at this way of life that has become forgotten to us. The reflective cinematography at times leaves you feeling as if you are witnessing a landscape from Star Wars, such is the alien nature of the Saharan desert to those not familiar with it. However the film does not shy away from the reality of the violent conflicts and battles the Tuareg have and still are experiencing. The balance between the beauty of music and the ugliness of war is a constant and vivid theme. In one scene a member of the rebellion reaches under a rock shelter to find a package hidden and buried under the desert sand, revealing a functioning AK47 gun to be used in raising arms for what they consider the fight to protect their way of life. The origins of the Tuareg culture remains a mystery and their heritage is a proud and ancient one. However one thing is for sure; after watching ‘Toumast’ you will have gained a rare insight into the world of the Saharan desert nomads and opened up a doorway of discovery into their vibrant and powerful music.